ATLANTA, Georgia (CNN) -- Tyler Perry has, for the first time, revealed graphic details about the sexual, physical and emotional abuse he says he suffered as a child. 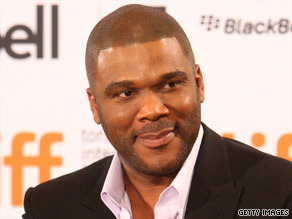 "I'm tired of holding this in," Tyler Perry wrote on his Web site, "... so I've decided to give some away." Perry recounts in a message posted on his Web site and in an e-mail to fans that a prescreening of the film "Precious," due out later this year, dislodged "some raw emotions and brought me to some things and places in my life that I needed to deal with but had long forgotten. It brought back memories so strong that I can smell and taste them." Perry is an executive producer of the movie, which tells the tale of Claireece "Precious" Jones, an illiterate, obese 16-year-old girl from Harlem who is emotionally and physically abused. "You ... jackass! You got book sense but you ain't got no ... common sense," he quotes his father as saying. "I heard this every day of my childhood," says Perry. One night when his mother was gone, Perry says, his drunken father "got the vacuum cleaner extension cord and trapped me in a room and beat me until the skin was coming off my back." Perry says that while at a playmate's house when he was about 10 years old, his friend's scantily clad mother locked the friend in the bathroom and told Perry to leave. "I was at the front door trying to get out, when she came in and laid on the sofa and asked me if I wanted the key. I told her I had to go home as it was getting dark. "She put the key inside of herself and told me to come get it, pulling me on top of her," Perry writes on his site. Perry said he was sickly as a child, and that made his father angry. His grandmother contended the family was wasting money on allergy shots. She said Perry had germs on him. One day when Perry's mother was away, he said, his grandmother decided "to kill those germs on me once and for all. She gave me a bath in ammonia." The violence in the home caused Perry's mother to pack up the car with him and his sisters and drive from Louisiana to California. Her husband reported the car stolen, and the family members went to jail until the father came to get them. Perry said his father beat his mother all the way home. The producer said he got through by turning to God, and he forgave his tormentors to help himself heal. Perry, who previously has spoken publicly in more general terms about his childhood abuse, explains his latest revelations this way: "I'm tired of holding this in. I don't know what to do with it anymore, so I've decided to give some away." In October 2008, he told Ebony magazine: "I tell people, if you're thinking about suicide, all that stuff I've attempted and thought about it. If you think about it, life gets better. The key to life when it gets tough is to keep moving. Just keep moving." Perry also is the writer, director and actor in boisterous comedies such as "Madea's Family Reunion" and "I Can Do Bad All By Myself."